Nothing ever seems to come easy for Anthrax. Label issues, personnel problems, PR nightmares and more have all plagued the New York metal stalwarts at some point over their thirty-five years. But due largely in part to their work ethic, and uncanny ability to relate to their fans, Anthrax never went away. And following the period of uncertainty fraught with lawsuits which led up to the eventual release of their tenth studio album Worhsip Music in 2011, the band has entered what seems to be one of the strongest prolonged periods of their entire career. Beginning with their 2010 participation in the "Big Four" concerts (alongside Metallica, Slayer and Megadeth), which brought arguably their most successful vocalist Joey Belladonna back into the fold, Anthrax has maintained a fairly stable lineup, allowing for the relentless, five year period of touring with bands like Volbeat, Slayer and Lamb of God that followed. The strength of those tours, and savvy placement on select festivals (like the Rockstar Energy Drink Mayhem Fest in 2012 beside Motörhead, Slipknot and more), unquestionably grew the Anthrax fan base, expanding their appeal amongst a new, younger generation of metal fans. The band is set to capitalize on all of that work in February with the release of the latest Anthrax studio effort, For All Kings (February 26th, Megaforce Records) and the feature of their profile as part of the Smithsonian's new "Places of Invention" exhibit. Q. You guys are a handful of dates into a tour that brings you back to the familiar territory of the Aragon Ballroom. How has it gone with Lamb of God so far and how’s the live reaction been to the new Anthrax music? Frank Bello: It's been great. We've been going at it for a pretty long time now and we have a new cycle coming up. The new record comes out February 26th: For All Kings. This is a great set up, the tour we're doing with Lamb of God, just because it's not only our fan base coming but Lamb of God's fan base coming. You can actually see it in the crowd. It's a really great vibe. It's a packed house every night, it's a good metal vibe going on and it's a great set up for the record. I think my tech at the time - thank God for this - he caught me before I went all the way through. Because it's a high stage, right? I remember my foot going through one of the planks or something in the front and I was like, "Noooo!" And all the sudden he caught me just before there was... damage. So don't go near that side of the stage! Q. Let’s talk about the new album. As well received as Worship Music was in 2011 with Joey Belladonna back on vocals, the whole process for this album seems like it was a lot different. This is the first Anthrax album to feature melodies written specifically for Joey’s voice in over twenty-five years. You’re primarily responsible for the melodies so how was it different for you this time around when it came time to start writing For All Kings? FB: It's much easier to write when you know who's doing the singing! (Laughs) Charlie and Scott and I, we get together and we always write the best Anthrax that we can. The song that turns us on, that gets us going, is the fire in your belly. You know what I mean? It's a whole lot easier to know who's putting the cherry on top with the vocals. And Joey is just an incredible singer. I'll tell you, I'm next to him on stage every night. The guy is better than ever. And I have to say that - not because I'm in the band - because I'm a fan. This guy has got the chops. It's fun to watch. I really can't wait till people hear For All Kings because I really think it's his best vocal performance ever. I honestly feel that. Q. Charlie used a lot of his down time following surgery to write. Between the writing of you, [drummer] Charlie Benante and [guitarist] Scott Ian, it sounds like the band entered the studio with more material than ever before. How did you go about whittling all of that material down into the finished For All Kings album? FB: We did. Charlie was home for awhile with his injury but Scott and I had music too. So it was great for the three of us to get together and just start putting songs together musically and then actually make them into Anthrax songs. It was a good process just to get into the studio again. Because we were touring so much. We continue to tour so much. But you know what's good about this whole thing? It's good to be touring. Because it's the only way to do it nowadays to get your music out there. But every time we thought we could take a break and start writing, we were asked to do another great tour. It was great tour after great tour after great tour. So we really couldn't say no. And it was all worthwhile. We grew the fanbase. There's a whole new demographic of people out there who hadn't heard Anthrax and now they have. From the "Big Four" on, it's pretty much been nonstop. It's been a great ride and we couldn't be more humbled or happier quite honestly. We can't wait for this new record to come out. Q. This record marks Jonathan Donais' first studio work as a member of Anthrax . You guys were able to tour with him on guitar a bit before recording with him. Did that make a difference upon finally entering the studio with him? FB: Totally. Absolutely. Jon's always been a great player with Shadows Fall. He's just a great player. I was a fan of Shadows Fall and they're still friends of mine, all that stuff. We definitely have a good time. There's a great vibe within the band. Q. Obviously the years leading up to the release of Worship Music weren’t easy ones with the legal battles, questions surrounding the lineup, etc. But it seems like you guys are on a real roll right now - there seems to be a lot of buzz around the upcoming album release. With the fairly relentless touring that you just talked about over the course of the last five years, do you feel like you’re kind of capitalizing on that work now with the release of this new album? FB: Here's what I think: I think you have to work. You cannot rely on anything else but good, hard work. That's the way we've always been. Our work ethic has always been there. You don't get nothing for nothing, that's the line. That's the way we grew up as New York guys. You don't just get handed anything. You have to work and make people know. You have to work and put out the best record we could. We have to do the best tours we can to make people hear this. Hopefully we get some radio play - whatever radio there is out there - and do what we have to do to make it happen. Look, this is the way we did it in the 80's. We're very much used to this. We are a very hardworking band and I'm so happy to see there's a buzz on the new Anthrax record. Thirty years in, we're talking about being a relevant band in 2016. And for one of the more anticipated records of 2016 to be For All Kings? It's an amazing feeling and, I'm telling you, we couldn't be more psyched. We're stoked about that. Q. It’s obviously difficult in this day and age to build buzz around a new album. And I think that’s what really intrigues me about this particular period for your band, that there’s not just interest in the live dates – because Anthrax has always had that reputation as a great live act – but there’s that buzz around the album too. 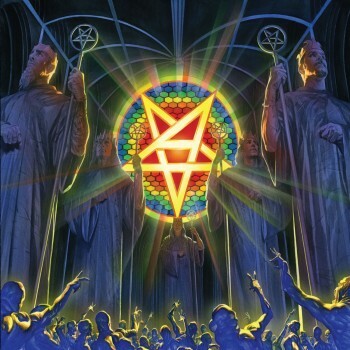 Not that Anthrax ever went away but does all this buzz right now around new Anthrax music kind of make for almost a new beginning for you guys, or at least mark a significant new chapter in the story? FB: Absolutely. You hit it on the head. Look, we took a long time to write this record. We edited it and we made sure every part was the right part on each song. We really took a long time and lived with the record and then came back to it and restructured it and made sure it was the right record we wanted to put out. So a lot goes into an Anthrax record. And then you have to take care of the touring cycle. And that's where we're at now. To have a record coming out next month - and this is the beginning of setting it up on the Lamb of God tour - it's all great stuff. I actually can't believe it. I'm really stoked on it. Because I know the touring plans we have coming! I say this in the most fanboy way... In March, we're touring all of South America with Iron Maiden. And here's the fanboy moment I'm going to give you. Number one, those are all stadiums and are all crazy. Iron Maiden, we're friends with them and we're huge fans of their's but then we actually get to fly on their plane with them! FB: He will be! There's my fanboy moment - just how psyched I am. We have a new record. It's all great. Anthrax is booked until September right now and, as we speak, we're booking September coming up. It's gonna be a busy year! It's definitely a good problem. But it's all from hard work. It's not the easiest thing to be on the road. We just finished Europe with Slayer [this past] October, November and December. It doesn't come easy when you have a family at home. It's definitely a different vibe. But it's all worthwhile to know that the hard work is progressing and paying off because people are getting it and they understand what we are which is great. Q. You just mentioned the European dates with Slayer and obviously you guys were there during the terrorist attacks in Paris. What was it like going from that type of touring atmosphere and coming back to tour now in the United States? FB: We just kept going. We never thought about... Unless the promoters wanted us to stop playing that tour - or there was a risk to our fans or the band and crew and stuff like that - we always had every intention to continue that tour. I live in New York so it's a different kind of thing. Everybody has to be careful about everything nowadays. That's just the world we live in now. What you have to do is live your life. That's more important than anything. You cannot not live your life. You have to move on and not cower to anything. You have to live your life as normal as you can do it. Q. You’ve used a word several times today that I’ve seen you use in virtually every interview you give and that word is “fan.” That’s something that has always struck me about metal artists – that there seems to be very little disconnect between the artists and the fans. To me, it’s kind of unparalleled anywhere else in music and it’s what I think made someone like Lemmy Kilmister so beloved across so many different generations. How important is that idea of not losing touch with your fan base to the success of Anthrax at this stage of the game in the current music industry landscape? FB: Wow. To be honest, I'm a fan. I'm a fan who got lucky. I feel very lucky and fortunate to play music for a living. You cannot forget where you came from. That's my values from growing up. My Grandmother told me that: "Don't forget where you came from." That's struck true for everything in my life. So I will never stop being a fan of music and this music and all kinds of music. I'm very fortunate that I've gotten to make a living doing this. Believe me, I'm thankful for it every day. But I don't think you should ever lose touch with where you came from or who you are. I will always be a fan because I think that's the only way that you can connect with people and understand music. I think if we write music that we're into, there will be a lot of people that like it the same way because they're fans the same way we are. I think it's all one. But the legacy of Lemmy is he is an amazing icon as we all know. Lemmy was also just a really great dude, a really nice guy when you talk to him. He was just a really good guy. He'd talk about anything. For me, particularly, it was about bass and tones and rock and roll tones and stuff like that. Just a really good guy. You know what the great thing about Lemmy was, for me, even before I was friends with him? I thought that Lemmy always did it his way. He made it ok to be yourself. For me, that meant a lot growing up. Seeing him, he was himself no matter what and he didn't care what anybody else said. I think that carries a lot with people. A lot of people can relate to that. I certainly did. I still do to this day. I think that can really translate and go across to a lot of people. There will never be another Lemmy. God rest his soul. I'm glad for his time on earth and the music he left us.